Easy make ahead holiday breakfast recipes: the effortless way to feed a houseful of guests on Christmas morning -- or any other morning! If you're planning to have a houseful of guests for the holidays, the last thing you want to be thinking about is what to feed them all on Christmas morning. 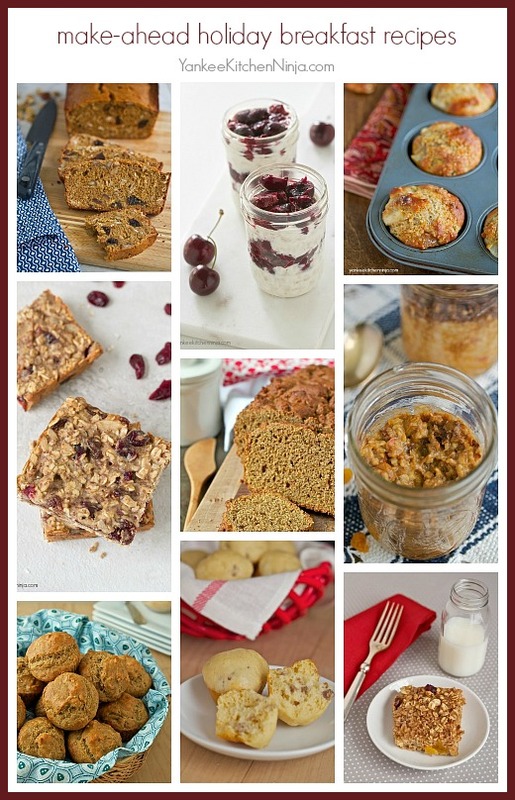 Give yourself a break by choosing one or more of my easy, healthy, make-ahead breakfast recipes. 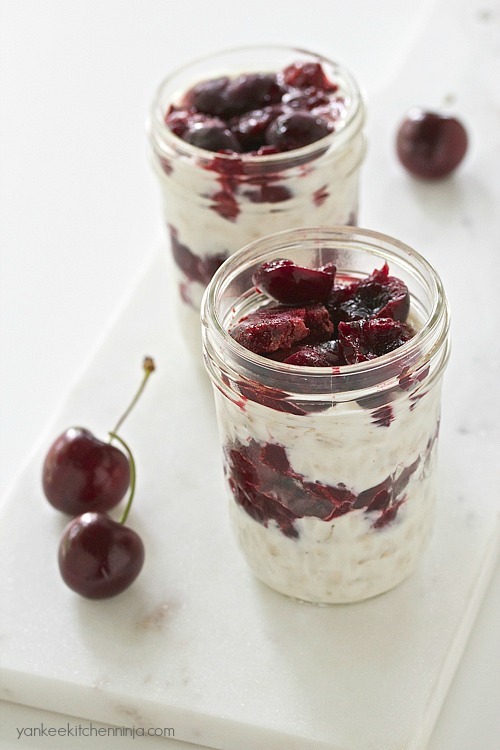 Oatmeal, baked goods, yogurt partfaits and more -- prep or bake before the big day so you can enjoy the morning as much as your guests. Happiest holiday wishes from The Ninj! 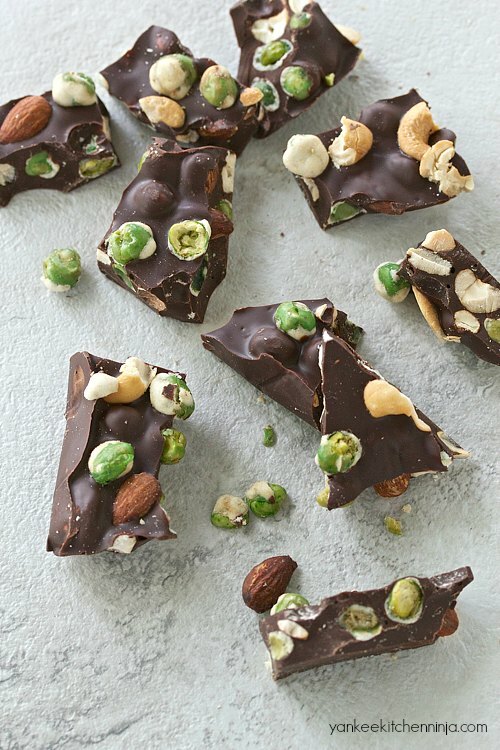 You'll love all these quick-and-easy yet impressive recipes for cocktails, snacks and appetizers for your next holiday cocktail party. 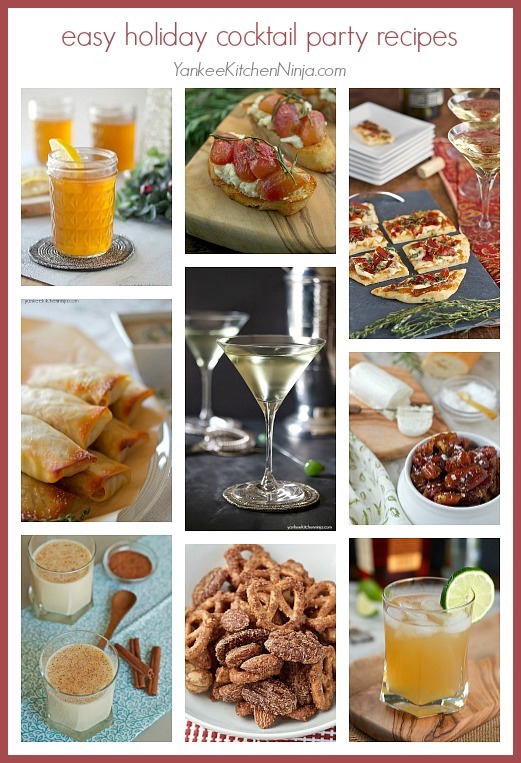 If you want to spend more time enjoying your holiday party and less time preparing and fussing over the food and drink recipes, you'll love all my ideas for quick-and-easy yet impressive cocktails, snacks and appetizers. Happiest holiday party wishes from The Ninj! 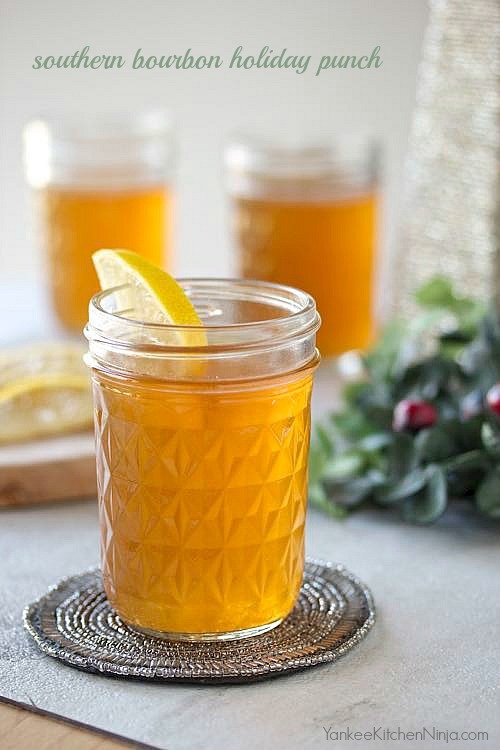 Made with sweet tea, fresh lemon and good bourbon, this Southern bourbon punch is the perfect drink for a holiday party or any festive entertaining. I bet you've been wondering why it's been a little quiet around Yankee Kitchen Ninja lately. If you subscribe to my recipe newsletter, you may have noticed that I'm not posting as much. It's time to tell you why. Hold on to your hats: We're moving. Again. Right before Christmas. It's turned out to be a much shorter stay here in Kentucky than we planned, as work has called us back to the East Coast. To Maryland, more precisely -- which is the first place we ever lived together as a couple, so it's a bit like going home. But moving is damned hard work. Which is why I haven't been able to devote as much time to you as I'd like lately. And this move is happening right smack in the middle of the holiday season, leaving me no opportunity for all the holiday decorating, baking and eating that I look forward to all year long. So my parting recipe upon leaving Kentucky is most apropos: Southern bourbon holiday punch, an homage to my brief return to the South and the home of the best bourbon anywhere. 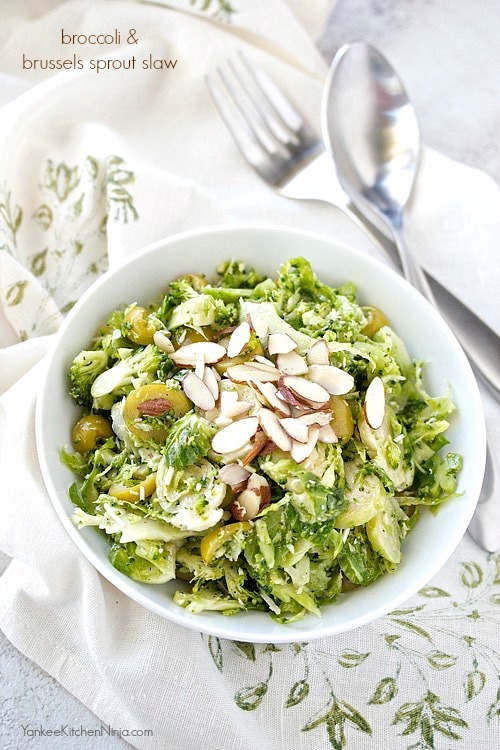 Broccoli and Brussels sprouts slaw with olives and almonds: a healthy, easy, make-ahead side dish for Thanksgiving or any festive dinner. If you saw my homemade "canned" cranberry sauce recipe last week, you'll understand that we often celebrate a little something I call "Fakesgiving" around Casa de Ninj. This year, we had our Fakesgiving last weekend, just before The Big Day, as we'll be traveling to a relative's house to spend the actual holiday. But I love our annual Thanksgiving dishes (and the legendary leftovers!) so much that I couldn't bear to miss them this year. So I had my own pre-Thanksgiving Thanksgiving: Fakesgiving. Each year, I try to add one new or modified dish to the line up to keep things fresh. Last year, it was apple and herb stuffing muffins. For this year's Fakesgiving, I forwent the traditional green beans almandine for something a little fresher and crunchier: broccoli and Brussels sprout slaw with olives and almonds. This smoked trout salad with peppery arugula, crunchy fennel and horseradish dressing is the perfect light meal or elegant salad course. So last week I showed you how to smoke trout -- or salmon or salt or lots of other stuff -- easily at home, either on the grill or your stovetop. (Yes, right on the stovetop!) And I promised that I'd show you some great ways to enjoy that smoked trout -- you know, other than just eating it with your fingers. 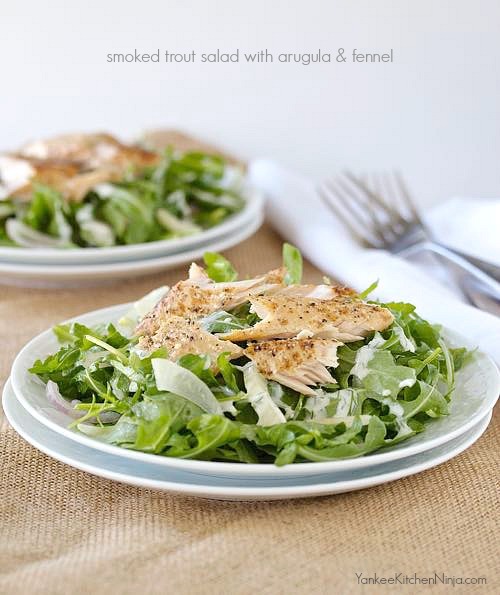 This smoked trout salad gets some extra peppery flavor from fresh arugula, as well as a little complimentary crunch from sliced fennel. 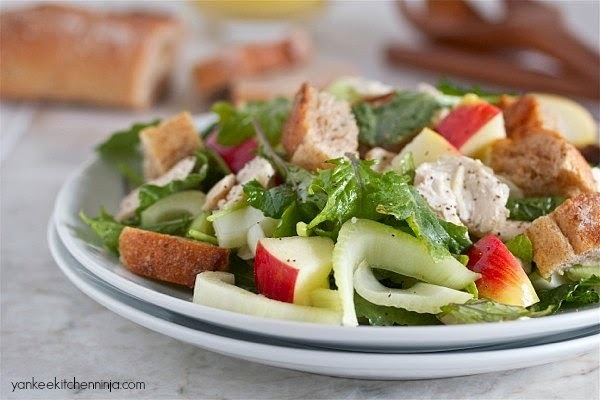 Drizzled with a horseradish dressing, it's an amazing blend of flavors that will have you wishing for seconds. 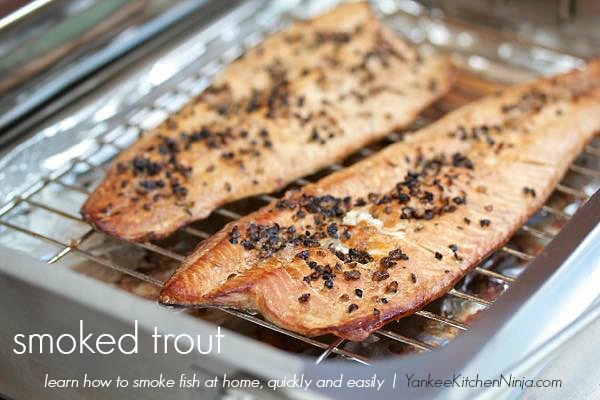 Learn how to smoke trout, salmon, veggies, salt or just about anything else quickly, easily and with no mess on the grill or even on the stovetop. Let's talk about smoked trout. Or smoked salmon. Or any kind of smoked fish. Do you love it? I do. Whether I enjoy it as part of a charcuterie board or a cheese plate at a cocktail party or added to a pasta dish or salad (like my bagels and lox pasta salad! ), I'm a smoked fish junkie. So the "I can do that!" DIY side of my brain kicked into high gear when I discovered an affordable little stove-top smoker a few years ago. Yes, a few years ago. Believe it or not, I got this stovetop smoker, made by Camerons Products, for Christmas more than two years ago and just never got around to using it. But I dusted off the box earlier this year and smoked some fish. And then some more fish. And then some salt. And now, since it's so easy, there's pretty much no stopping the smoking train around Casa de Ninj. If you do nothing else this year that I've told you to do, do this: buy this stovetop smoker -- or give one to someone as a gift. It's the coolest thing ever, I swear. Not to mention that it's crazy easy to use and you can smoke all sorts of stuff with zero mess. 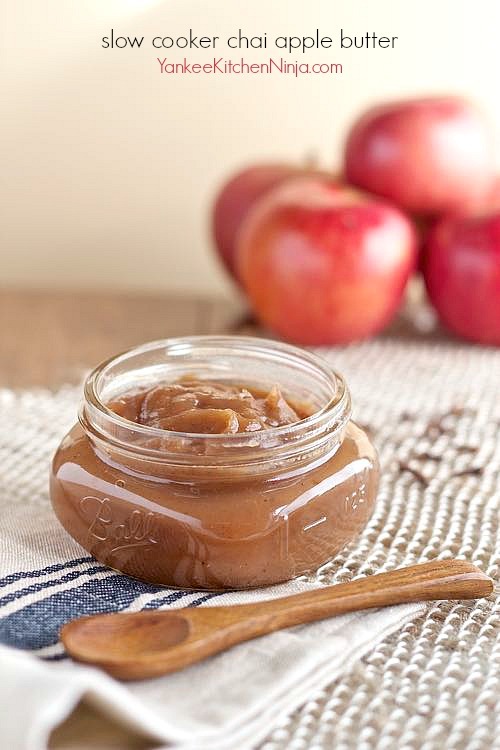 Easy slow cooker chai apple butter: Use it as a flavorful spread or swirl it into your morning yogurt, oatmeal or cottage cheese. Last day to talk about apples, I swear. But that doesn't mean I'll start talking about pumpkin. Heck no -- that ship sailed this year and I can't say I missed it. No, we'll move directly into preparations for this food blogger's high holy day: Thanksgiving! And then we'll talk about all the blow-your-mind things you can make with those tons of Thanksgiving leftovers. But before we start talking all about the Thanksgiving sides and Mr. Ninj's famous deep fried turkey, let's have one last hurrah for apples. Which I've doctored into a chai-spiced apple butter that is super easy, because it calls for ground chai tea and is made in the slow cooker. Effortless low cooker sweet potato and cheddar soup: easy, healthy and with just a bit of kick from smoky chipotle peppers. 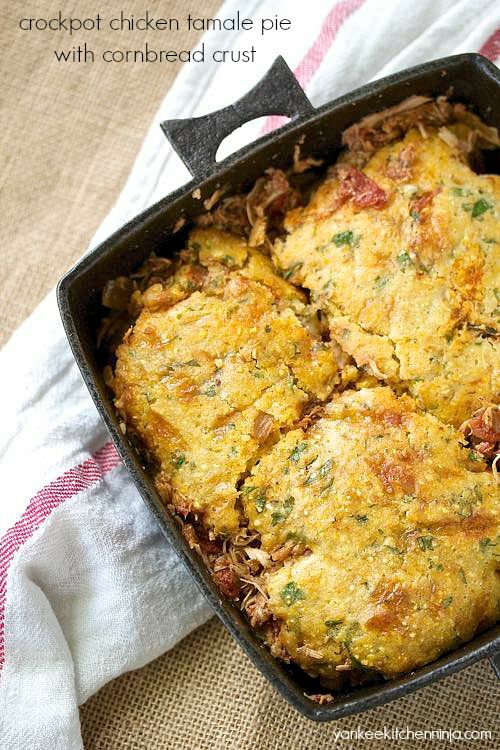 Effortless fall comfort food! As we near the end of October, I'm happy to say that I still haven't made or eaten anything with pumpkin in it -- AND I HAVE SURVIVED! Seriously, I'm not a pumpkin hater. Not at all. 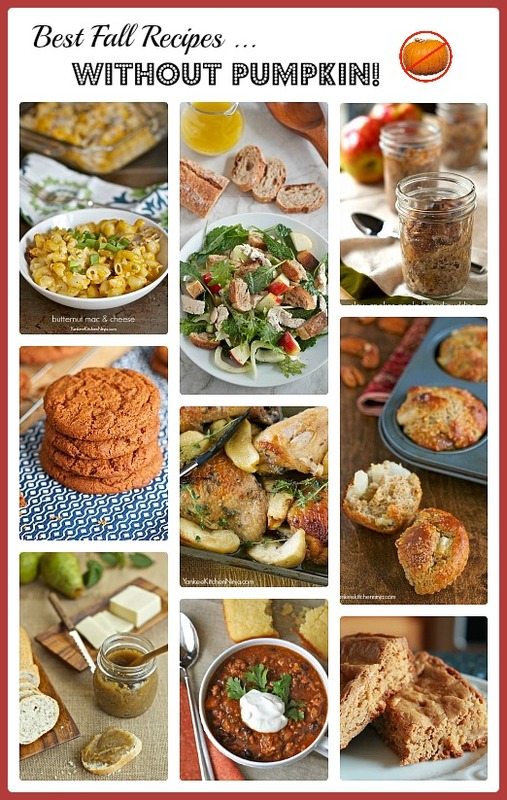 You'll find lots of pumpkin recipes here on the blog. But this year, pumpkin-spice everything has made me feel like taking a pumpkin holiday and focusing on enjoying the other fruits and veggies of fall. 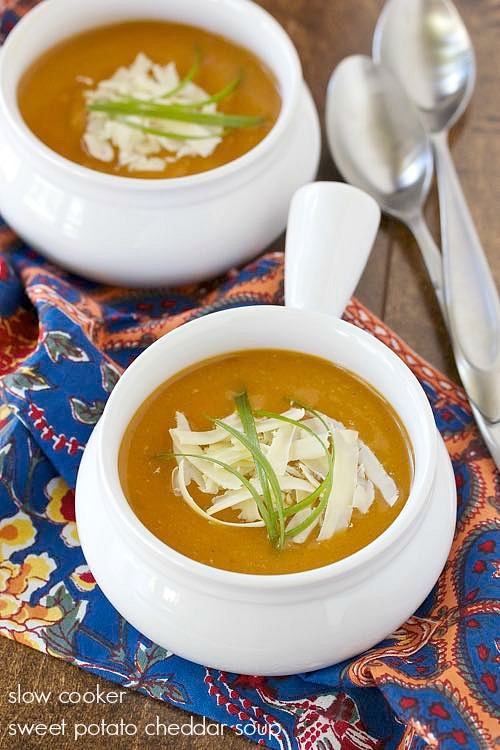 Which is how I got hooked on this slow cooker sweet potato and cheddar soup. It's got a couple of canned chipotle peppers in adobo sauce cooked into it, which gives the soup just the right amount of smoky spiciness. It's like taking all the best flavors and smells of fall and immersion blending them into a warming, comforting bowl of soup. Makes me want to snuggle in front of a fire with a cozy chenille throw. Which I could do if it would stop being 78 degrees outside every damned day! Jeez louise, enough already with the summertime: I am so ready for fall. Tender and saucy maple ginger chicken and apples: perfect fall comfort food that's healthy and super easy to prepare. Given that it's finally starting to feel like fall, I seem to be eating a lot of cold-weather comfort foods. Gone are my insatiable cravings for cool summer salads or still-warm sun tea. Now, I'm all about slow roasting and crockpotting. But still no pumpkin. I'm just not feeling the pumpkin love this year for some reason. No, I know the reason: too much pumpkin-spice this and pumpkin-laden that all over my social media feeds. I just can't do it. Not when there are so many other way more delicious fall fruits and veg out there, just waiting to be featured in a comfort food recipe. Like apples. 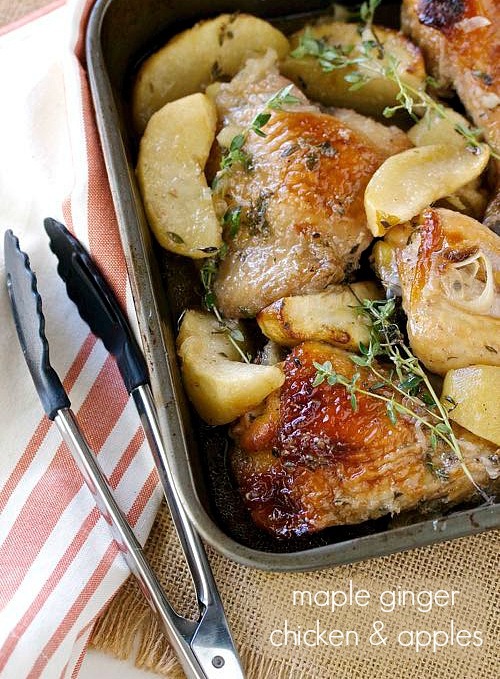 Clearly my awesome blogging friend Katie Webster of Healthy Seasonal Recipes agrees with me, as the recipe I'm sharing today for maple ginger chicken and apples comes directly from her new cookbook, Maple: 100 Sweet and Savory Recipes Featuring Maple Syrup. Peeps: I am over-the-moon excited about this book -- and not just because Katie is super-talented and one of the nicest people you could ever hope to meet. Like me, Katie is all about real-food recipes, made with fresh, healthy and seasonal ingredients that everyone in your family will go cray cray for. I have little post-it flags on more recipe pages than I can count in this cookbook. I'm a little bit in love with it and plan to give a copy to everyone I know for the holidays. But you don't have to wait for the holidays because I'm going to give away a copy of Katie's cookbook to one of you this week! Simply follow the instructions in the widget following the recipe for your chance to win a copy. 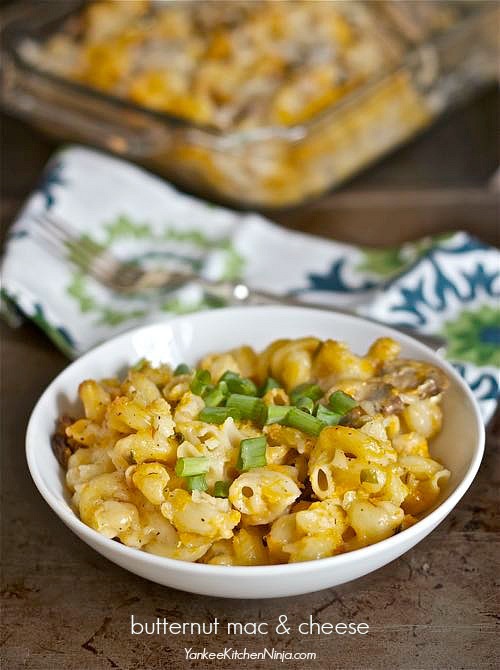 Butternut mac and cheese is a hearty, meatless dish that even the pickiest eater will love; so good, they'll never suspect it's healthy! This recipe originally appeared in 2013 on the Kitchen Apparel blog, as part of a blog swap. Since that blog is no longer active, Sandra, its owner, graciously gave permission for me to repost it here at Yankee Kitchen Ninja. We'll miss Sandra's gorgeous photography and healthy recipes but wish her much luck and success in her new endeavors. As part of the blog swap, given that we planned it for October, we considered making something with pumpkin. Then, as now, we realized that we were already completely sick of pumpkin (and assumed you probably were, too) so instead opened our topic up to all fall squash. And, out of “all fall squash”, we both ended up making a pasta dish using butternut squash. But come on, who can blame us? It's the squash that, with a little butter and maple syrup, can nearly taste like candy. Sandra's recipe (which I'm happy will live on as part of Yankee Kitchen Ninja!) was a gorgeous, delicious pasta with butternut squash, broccoli and cranberry beans. I urge you to try it. But I also urge you to try this butternut mac and cheese recipe -- it's freakin' awesome, and only partly due to the fact that Mr. Ninj actually ate it. Little back story: Mr. Ninj is not a fan of vegetables and claims that it's not often the taste but the texture that turns him off (he is genuinely afraid of asparagus in any form). It's sort of like having a 3-year-old picky eater, to which I'm sure many of you can relate. So when he saw the roasted butternut squash sitting on the kitchen counter as I pulled this dish together, he freaked. I assured him that, because it was being incorporated into the cheesy sauce, he'd never even know it was there. I was lying, of course -- but, holy smokes, it turned out to be true! 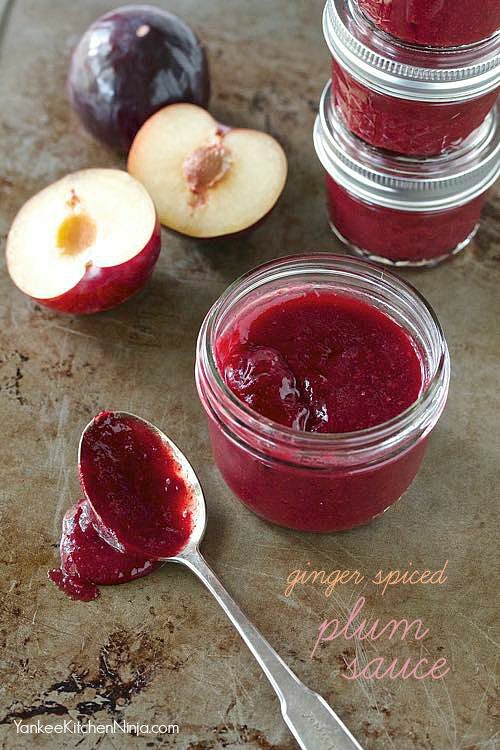 Spread this easy ginger spiced plum sauce on grilled chicken or pork, turn it into a jammy vinaigrette or swap it for fruit puree when baking. Yep -- it's happened once again. It isn't even October yet, but every yoga-pants-clad food blogger is waxing poetic about all the pumpkin-spiced things that bring her joy. Except The Ninj. I may be wearing the ubiquitous yoga-pants uniform of the work-from-home writer, but I'm still refusing to talk about pumpkin. I'm still hung up on end-of-summer / beginning-of-fall fruit. Plums to be exact, which you'll recall featured prominently in my recent fresh plum breakfast cake. Good lordy, y'all, I haven't even gotten started on apples yet, let alone pumpkin! Plus, I realized, much to my chagrin that, given my lack of a real garden this year, I haven't canned or preserved very much. And that, my friends, is more than a little TRAGIC. The lack of canning and abundance of fresh plums brought me to this ginger spiced plum sauce. ERMERGAHD, this stuff is so heavenly spread on freshly grilled chicken or pork -- just the right amount of earthy spice, tartness and sweetness. Shred the chicken and mix in the plum sauce and you've got the basis for an Asian-inspired taco that will blow your mind. I have even mixed this plum sauce with a little oil and vinegar to make a jammy vinaigrette for a peppery arugula salad. And I also think it would be lovely baked into some marmalade muffins or my favorite homemade granola. 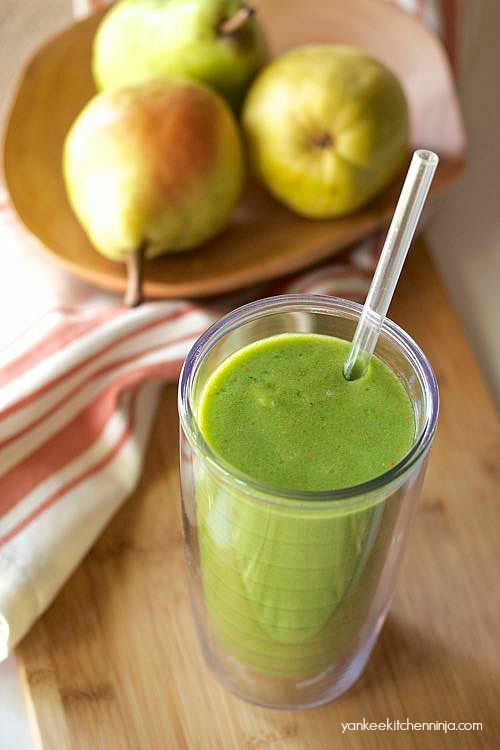 Ginger pear green smoothie: an easy portable power breakfast packed with protein that's also low in calories, gluten free, dairy free, vegan ... and delicious! Pears are one of my favorite things about fall. I'm less about pumpkin and more about pears. And lately I've been kind of obsessed with the pairing of ginger and pears (pairing pears -- ha ha! -- I didn't even plan that). And it's not just in recipes: I recently went a little cray cray when I found a ginger-pear hand lotion. I've really gotten into a smoothie groove lately. 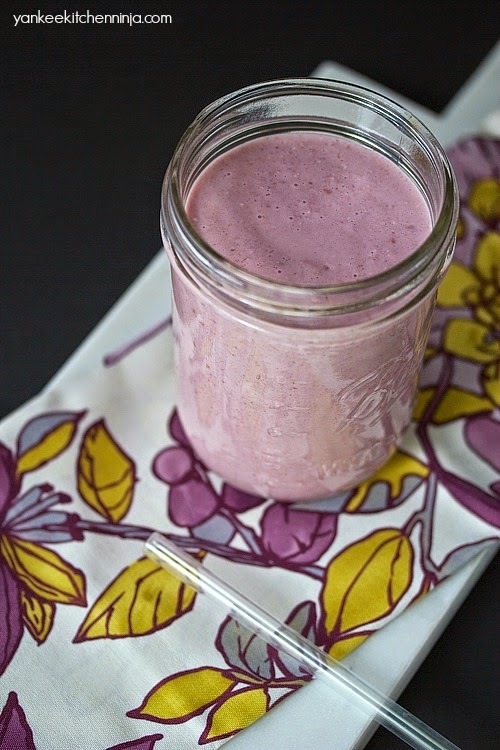 When you're trying to maintain a healthy lifestyle, smoothies can be so helpful. They make eating a healthy breakfast easy and are a perfect afternoon treat when I'm in the mood for a little snack. Way better for me than answering the siren call of cookies! Fresh plum breakfast cake -- a not-too-sweet treat, perfect for showcasing end-of-summer juicy ripe red plums. I found some gorgeous, juicy, ripe red plums at a local farm market recently and my brain immediately jumped to plum cake. 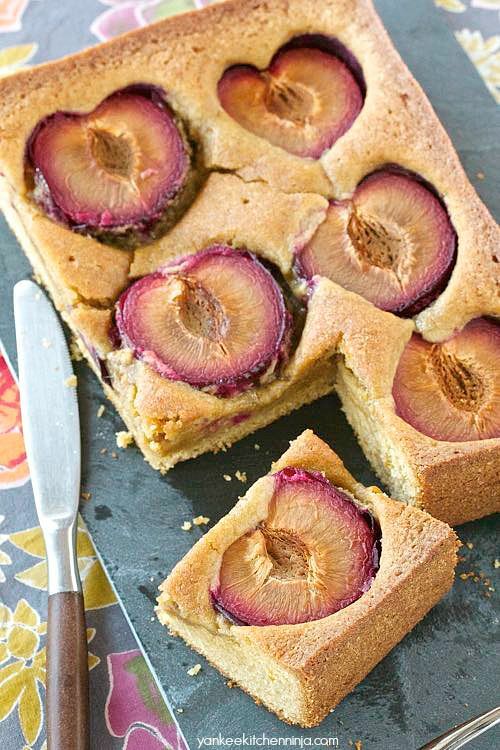 A plum cake that you could eat for breakfast. Dancing in my next-door BFF Nancy's rec room basement to a real jukebox that played my favorite song at the time -- Elton John's "Crocodile Rock"
Seriously. Those are my only take-aways from that house. But those plums! My mom used to turn them into this amazing, dense plum cake that I loved -- largely because it wasn't too sweet and, after we'd had it for dessert the first evening, she would often let us have a piece for breakfast, too. Because fruit is good for you, I guess. Unfortunately, my mom was out of town recently when I scored my red plums so I didn't have access to her recipe. And I wasn't sure I wanted to mess with a classic by trying to use the juicier red plum instead of the prune plum, so I turned to my favorite, reliable baking source -- Dorie Greenspan's Baking: From My Home to Yours -- for an alternative. OK. Labor Day was yesterday so now I can be excited about fall and back-to-school time! Anyway, back to back to school. 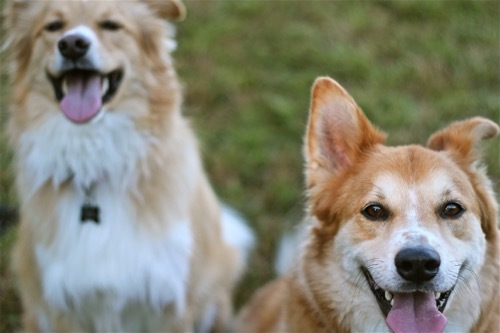 I'm not going back to school nor are my dogs (although they could probably use it), but I'm excited regardless. And the reason I'm excited is this super easy, five-minute healthy chocolate pudding. Yes, pudding. Why do pudding cups excited me? Because I pack lunches. Healthy lunches. 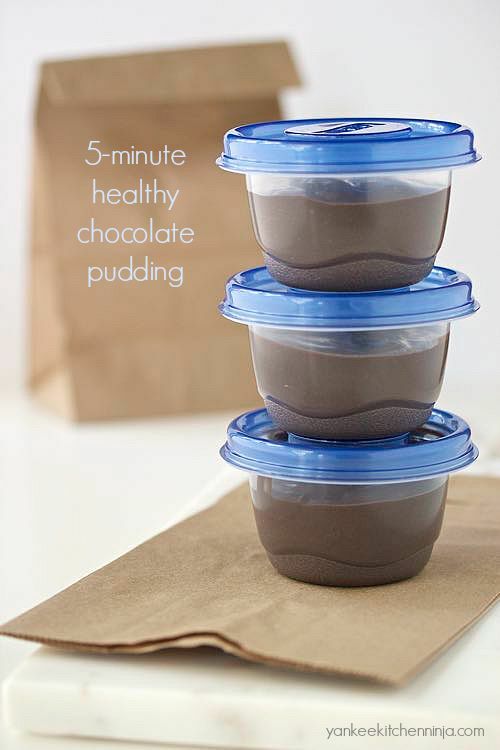 And who could possibly say no to a healthy chocolate pudding cup in his lunch bag? Not Mr. Ninj, the recipient of my healthy lunch bags. Heck, I even went out of my way to style the photos of my five-minute healthy chocolate pudding in such a way that the lunch-bag-packing intention was entirely obvious. 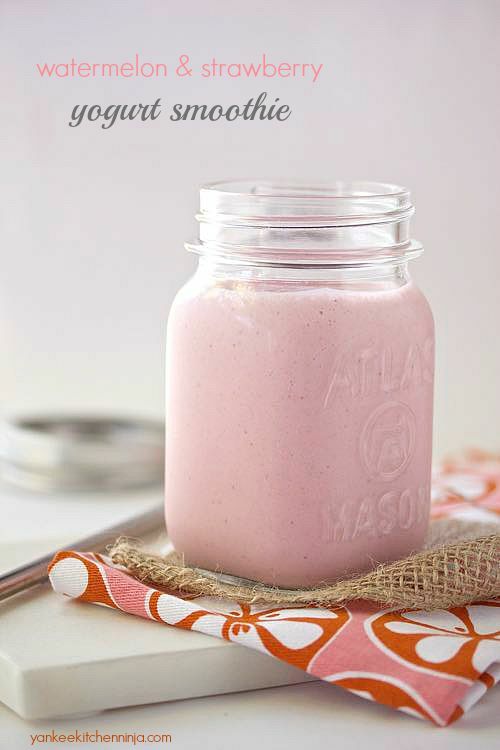 This delicious yogurt smoothie is loaded with protein, probiotics, fiber, fresh fruit and even some secret veggies: healthy breakfast never tasted so good! While I love fall and the cool weather it brings, I try not to rush it because it also means the end of summer -- which means the end of bountiful, healthy, delicious summer veggies and fruits. Other food bloggers may have already gotten started on PumpkinFest 2015, but not me: I'm still buying as much ripe fruit as I can get my hands on! Which means I knew exactly what ingredients to use when I was chosen to create a smoothie recipe using Chobani Greek Yogurt for Smoothie Week, being celebrated at the Kroger Family of Stores this week. Even though it's September, it's still the perfect time to enjoy watermelon, which will be in season for a little while longer. For this watermelon strawberry yogurt smoothie, I used fresh watermelon but, once the cooler months roll around, you can use frozen watermelon instead; it's a great way to get the feeling of summer back any time of the year. Because of its high water content, watermelon freezes beautifully. I cut it into chunks, spread them on baking sheets, freeze until just firm, then store all the chunks in zipper bags in the freezer. Freezing them individually means you can easily remove only as many pieces as you need. It's easy to make your own kale powder in the oven or a food dehydrator -- a great way to sneak lots of veggie nutrition into smoothies, soups and more. When summer begins to wind down, my preserving instincts kick into high gear. I start to panic: Fall is coming. What will I do without juicy fresh tomatoes? Or handful after handful of fresh basil? Or ripe peaches? Or fresh greens from right outside my back door? Right now, my freezer is full of peaches, blueberries, strawberries and watermelon for winter smoothies and my pantry is loaded up with marinated dried tomatoes that I can turn into an amazing pasta sauce or layer on pizzas. 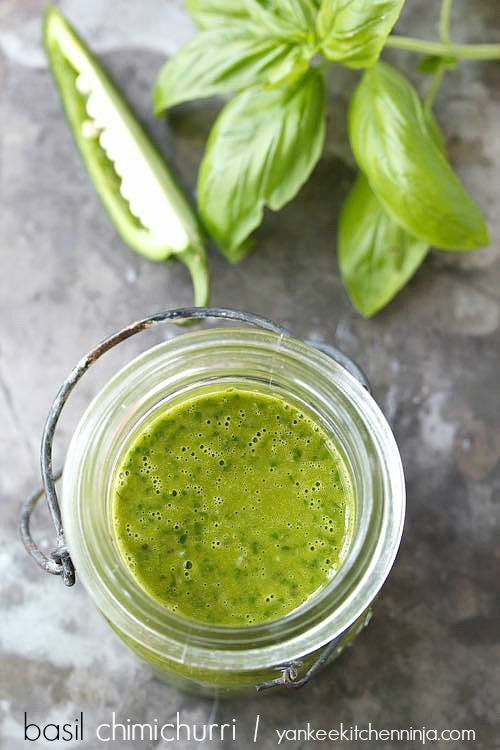 And making a winter store of pesto and basil chimchurri is on my to-do list for next week. So what about the greens? While I have tried freezing heartier greens like kale and collards, they're really only good for soups and stews once thawed, as their cellular structure really breaks down once frozen. The best way I've found to preserve fresh greens is to dehydrate them and turn them into vegetable powders. In the past, I showed you how to make tomato powder, which is an awesome way to add a huge pop of fresh tomato flavor to soups and pasta sauces or mix with yogurt or salad dressing to create a veggie dip. All it takes is a few hours in a food dehydrator or on low temperature in your oven. 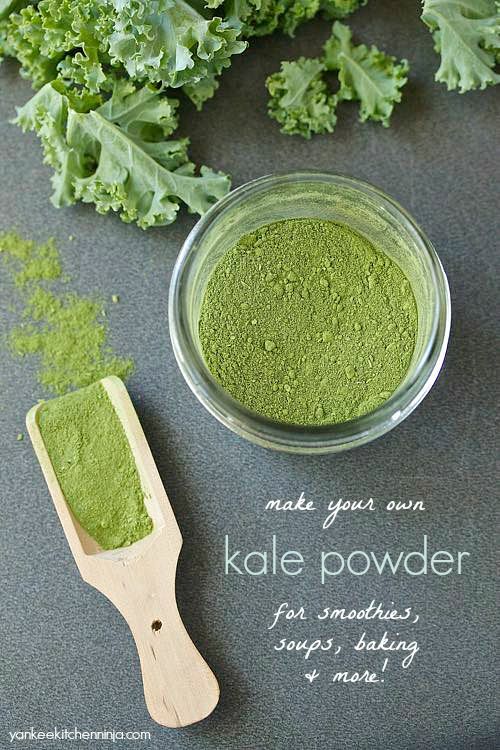 Making greens powder -- in this case, kale powder -- is accomplished the same way. My favorite use for this kale powder is very sneaky. Regular readers know Mr. Ninj, who never met a vegetable he liked, is my equivalent of mommy bloggers' picky 3-year-old eaters, so I'm always on the lookout for stealthy new ninja-like ways of sneaking vegetables into his diet. Mixing this kale powder into his morning smoothies has become my secret weapon! 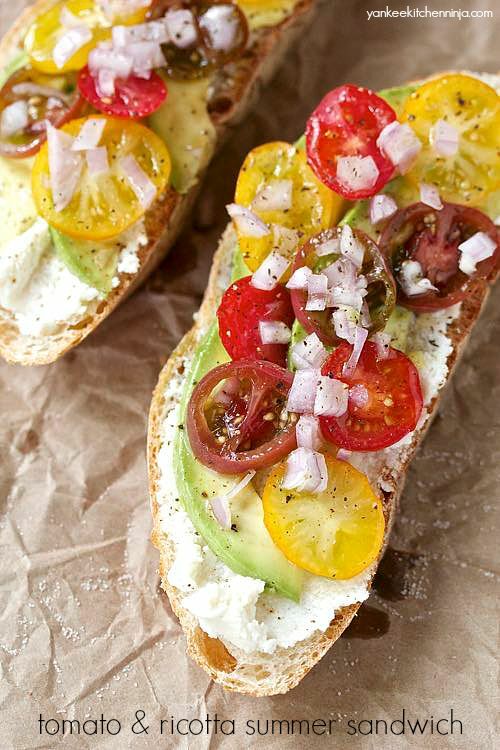 Layer the ripest, juiciest tomatoes on fresh, hearty bread with ricotta cheese and avocado for the perfect summer sandwich. I know you're back in school, kids -- well, some of you. The ones that live near me here in the South anyway. And I know apple-picking has begun in Vermont. Despite the fact that the squirrels ate every single tomato from my plants as soon as they appeared, let alone waiting until they turned even a tinge of orange, I've been noshing on ripe, juicy tomatoes as often as I can -- especially in tomato sandwiches -- thanks to the many apparently squirrel-less local Kentucky farmers. For about two years now I've been carrying around a page torn from a back issue of House Beautiful magazine, of all publications, that featured an open-faced avocado sandwich from Gabrielle Hamilton's NYC restaurant Prune. It caught my eye because it featured tomatoes, avocado and ricotta cheese -- probably three of my most favorite ingredients. Evah. Whatevs. Ninj ain't got that kinda time at lunch, dig? Basil chimichurri is slightly spicy and full of summer garden-fresh herbs: a perfect marinade for grilled flank steak or skirt steak. I've been rockin' the hashtag #StillSummer on all my social media posts this month, lest we all get caught up in the back-to-school rush and forget to enjoy the warm, wonderful weather. Which for me is largely about grilling and eating al fresco! Truth: Part of why I love grilling so much is because I don't do it -- Mr. Ninj does. Which means that I get a little bit of a break in meal prep whenever we grill. Sure, I still make the salads and sides but it's fun to have my load lightened a little, especially during the week. Another reason I'm reminding myself and everyone else that it's #StillSummer is because of fresh summer produce. Seriously, is there a better time of the year to be a healthy eater? I could pretty much live on sun-warmed fresh tomatoes, corn and peaches during July and August and never get sick of them. Plus, the basil in my yard, which, sadly is the only thing that the squirrels and deer haven't completely decimated, is prolific to the point of being out of control. At this point, I usually make a ton of pesto and pop it into the freezer to enjoy during the fresh-veg wasteland that is winter. Since I have so much basil this year, I decided to use it to make this riff on chimichurri, substituting basil for the usual cilantro. It turned out to be the perfect sauce marinade for grilled flank or skirt steak. Lightened blue cheese potato salad, made with Greek yogurt, is the perfect side for late summer BBQs or back-to-school weeknight dinners. I can't believe it -- kids are already headed back to school. Seriously: that's cray cray. I feel as if summer has barely gotten started yet the new bus drivers are driving training routes through our area in preparation for the first day of school next week. I grew up in New England, so I associate the first day of school with, roughly, Labor Day, not the first week in August. In my book, August should still be summer, given that it is still summer according to the calendar. And the thermometer as well. Lordy, who can think about back-to-school corduroys when it's in the 90s outside? All I can think about is grilling out or eating salads so as to not heat up the kitchen. Long live the August BBQ cookout! And, of course, what's the best thing about cookouts? The side dishes! 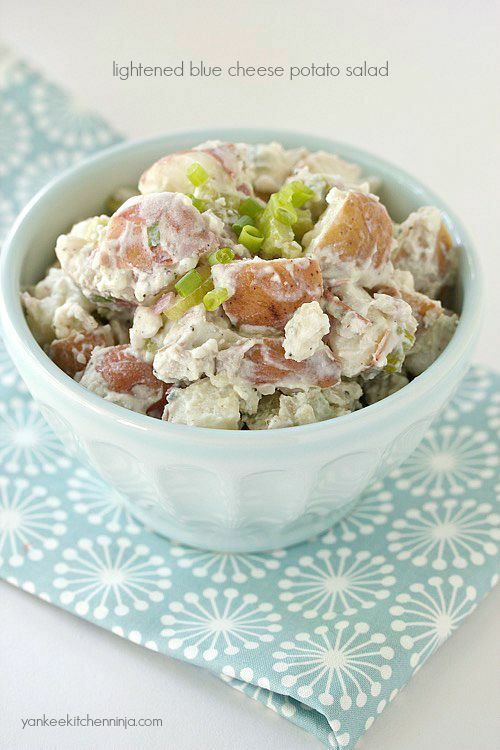 And nothing says "cookout side dish" like a good, creamy potato salad. Enjoy fresh, juicy peaches in not only sweet recipes but also savory ones: try these five easy, delicious recipes while peaches are in season. There, now that I have your attention, let's talk about peaches. I'll admit, there's little better than eating a ripe, juicy peach, still warm from the sun, on a hot summer day. But when I've gotten a haul of fresh peaches, I can't eat all of them single-handedly. After freezing them for winter smoothies or canning them as peach puree for my homemade granola, I turn to these five recipes. For your sweet tooth, I've got a grab-and-go breakfast muffin, an easy crumble and an unusual cobbler. 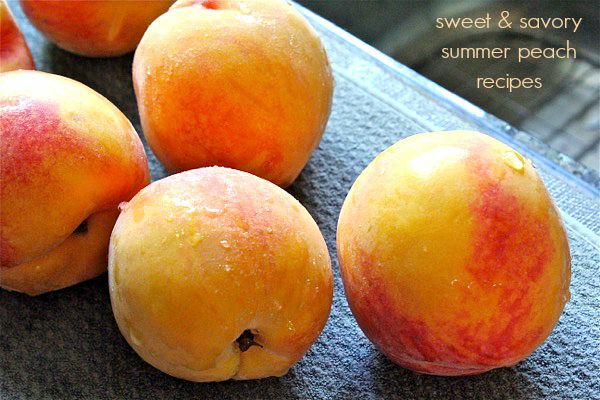 But peaches are just as fantastic in savory dishes, especially when paired with their summer cousins, fresh tomatoes, or even tangy blue cheese. Yep, The Ninj is serving peaches for dinner. 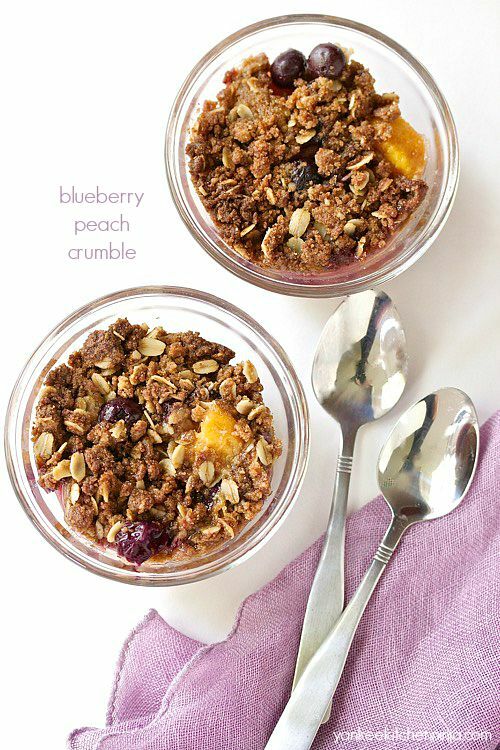 Super-easy blueberry peach crumble with juicy summer fruit and a toasty oat crumble topping. Enjoy it for breakfast or dessert -- or both! It's pretty much the perfect storm of summer fruit out there right now, isn't it? Everything I love is happening all at once: the strawberries and cherries are winding down, while the blueberries and peaches are totally kickin' it. My freezer is a sea of vacuum-sealed bags of frozen summer fruit, ready to make the best winter smoothies (I don't know where I'd be without my FoodSaver vacuum sealer!). But I'm not just freezing all my summer fruit: heck no! I'm eating it like there's no tomorrow and I'm also cooking with it. One way I've used fresh peaches and blueberries (they are just THE BEST partners, aren't they??!!) is in this super-easy blueberry peach crumble. Now, little known fact: a lot of people misuse the words "crumble" and "crisp" when describing their baked fruit desserts. I grew up on apple crisp that included oats in the topping. Apparently, that was a crumble, not a crisp. By definition, a crumble is just a crisp with oats in its topping -- or maybe it's that a crisp is just a crumble without oats. Regardless, this blueberry peach crumble is ridiculously easy to make and is so good and fresh that I almost enjoy it more for breakfast than I do for dessert. Mediterranean pasta with no-cook olive sauce: an easy weeknight meal featuring key ingredients from the Mediterranean diet to support health and longevity. You've probably heard about the health benefits of the Mediterranean diet (namely living longer -- yay for living longer!) -- the diet that's rich in good-for-you foods like whole grains, seeds, legumes, veggies, fish, olives and olive oil. Couldn't we all use more of these healthy ingredients in our diets? You betcha. So, just for you, I've created a pasta dish, featuring California Black Ripe Olives, that pays homage to the healthy Mediterranean diet. I have never met anyone who doesn't love black olives. And, if you're like me, you almost always have a can of them on hand in the pantry, right? Which makes them totally handy for creating quick, weeknight meals. Plus, black olives contain a variety of vitamins and fiber -- and, of course, you can wear them on your fingers. 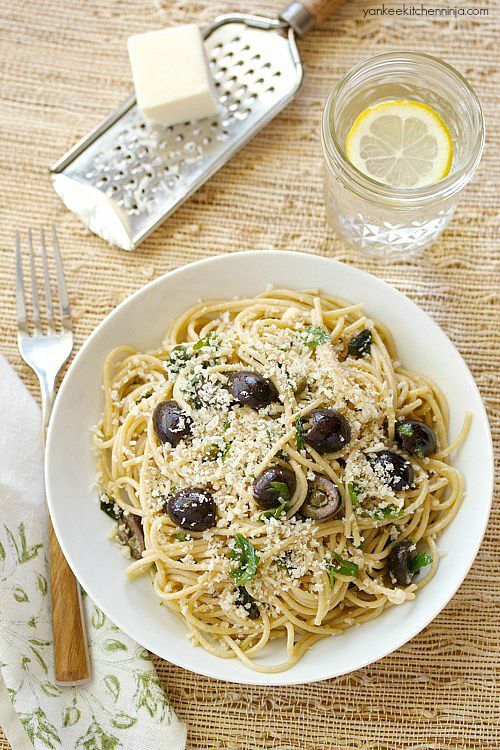 For all of these reasons (not the least of which is the finger-wearing, if we're being honest), California Black Ripe Olives were the perfect choice to star in my new Mediterranean pasta dish. I paired the olives in a no-cook sauce with tangy capers, lots of fresh herbs from my garden, a squeeze of fresh lemon juice and some mashed anchovies (trust me -- they add an awesome yet subtle umami flavor that you will love! 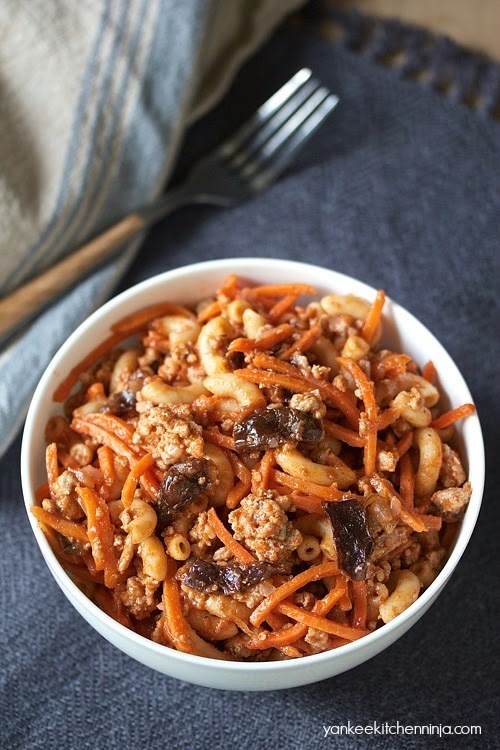 ), then tossed them all with healthy whole-wheat pasta: it's an easy weeknight meal that's not only delicious, reminiscent of an olive tapenade, but also incorporates many key components of the Mediterranean diet. 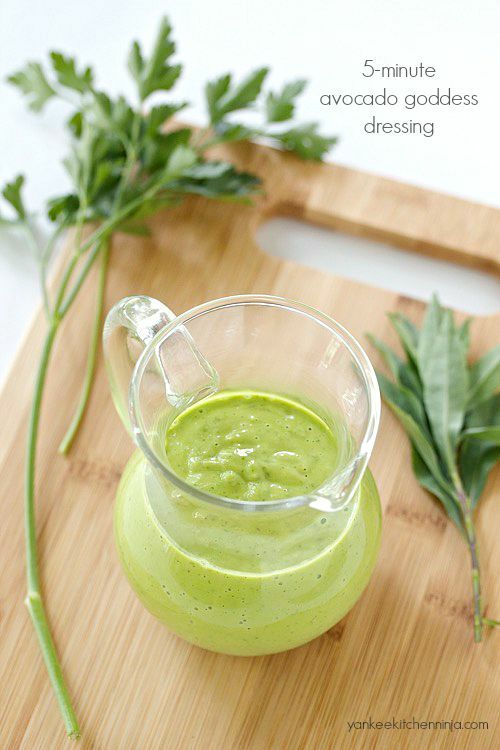 Jazz up your next meal salad or roast chicken dinner with this 5-minute, herb-filled, healthy avocado goddess dressing. Sometimes it's the little things that can make or break your meal. Like salad dressing. I've been in a simple balsamic vinaigrette rut lately. Not that the vinaigrette isn't good, it's just that I feel I should be whipping up batches of shallot dressing or sushi-restaurant-inspired ginger dressing or even classic buttermilk ranch dressing ... but I just haven't. And it's bumming out my salads. And it's because of herbs. My "garden" this year, post-relocation, consists of a couple of planters of vegetables on our back patio. Given the end-of-days, seemingly non-stop rain storms we've had nearly all summer long, coupled with the 30,000 crafty, tomato-stealing squirrels and deer, my supply of homegrown veggies so far has been two half-sized cucumbers and four measly Sun Gold cherry tomatoes. It's a pathetic situation. Thankfully, I've got plenty of farmers' markets around to make up the difference. But my little in-ground herb garden, on the other hand, has been doing quite well. (Apparently the wildlife prefer their meals to be heartier.) So I've been trying to come up with herb-filled recipe ideas that aren't simply pesto, although a good (or unique) pesto is nothing to scoff at, that's for sure. Trust me, my freezer will be full of it come September! 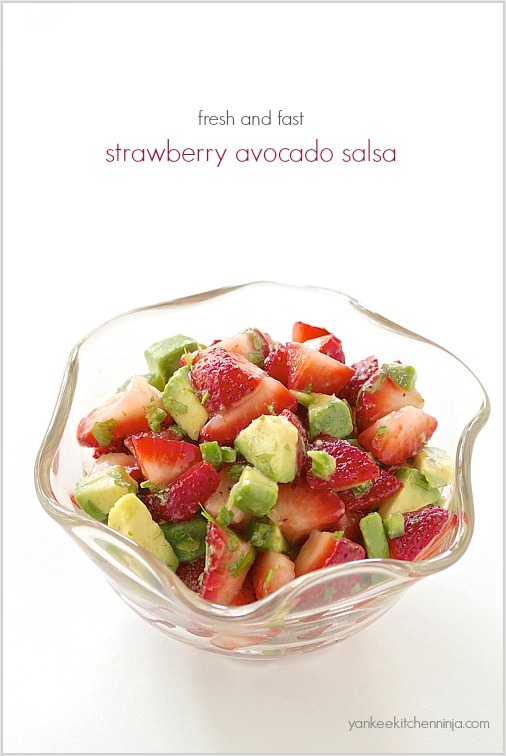 Enter this avocado goddess salad dressing. Chockful of fresh herbs, this healthier riff on traditional green goddess dressing gets its rich creaminess from avocado and yogurt. And it's the most delightfully cheery green color you could ever hope to add to a salad. 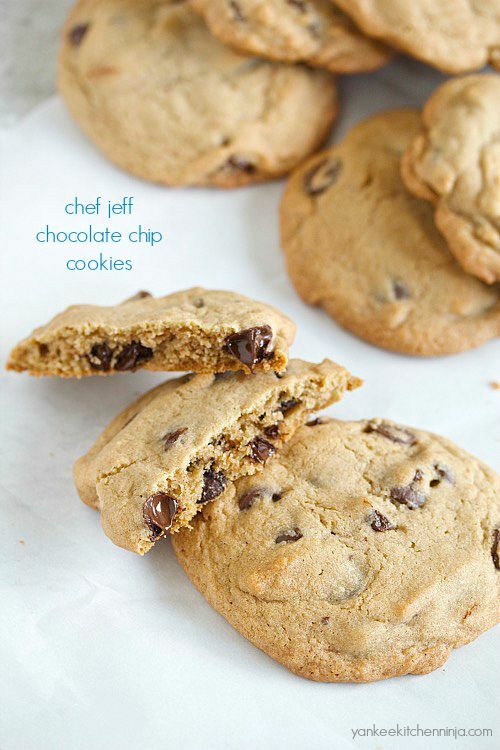 Chef Jeff chocolate chip cookies are a favorite of Mount Holyoke College students and alumnae -- and perhaps the best chocolate chip cookie EVER. Heads up, peeps: This is not really one of my usual healthy recipes. But, as a firm believer in moderation rather than denial, I'm sharing it anyway. Wicked. Awesome. Cookies. With a story. 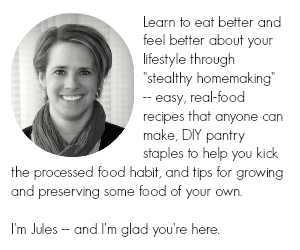 Some of you may know that I am an alumna of Mount Holyoke College in Western Massachusetts. As a nearly 200-year-old college for women, my alma mater has quite a few traditions that we alumnae hold dear. Apparently the Chef Jeff cookie is one of them. I say "apparently" because these cookies didn't exist during my tenure at Mount Holyoke. When I was an undergrad, we were fortunate enough to not have to endure typical university-style centralized dining. No, my friends, we took each of our meals in the common dining room of our residence halls, eating and socializing like a family. Dining regularly with those with whom you lived built an indescribable sense of community, the reaches of which I still feel on a daily basis, no matter how far away from the campus I move. Chef Jeff chocolate chip cookies. Turn your favorite breakfast into your new favorite dinner with this unique bagels and lox pasta salad. I have this theory -- which I put into action every Friday night -- that you can turn almost anything into a pizza. Whatever leftovers I have lurking around in the fridge at the end of the week generally get turned into pizza toppings for Friday Pizza Night. Totally true. Even things like my pan-roasted cauliflower pasta -- minus the pasta itself -- ended up on some pizza dough, topped with cheese. And it's (almost) always a success. Hence my theory. lots of your favorite flavor combinations can also be turned into pasta dishes. And I'm proving my theory today with this bagels and lox salad. 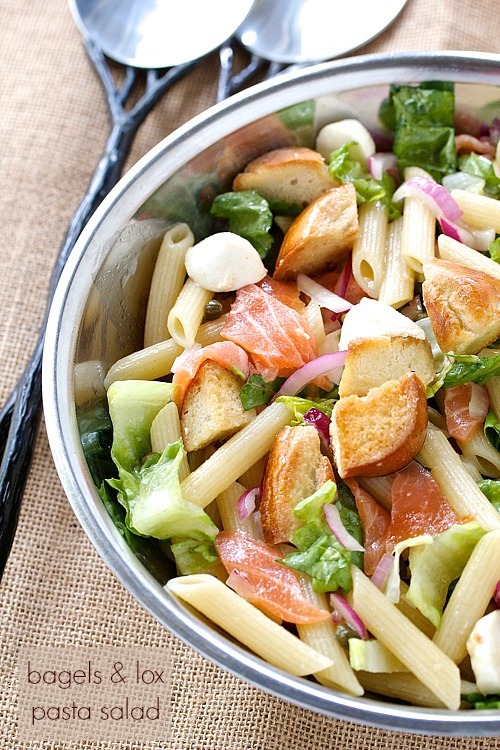 Bagels and lox -- IN A PASTA SALAD. I know, right?!!! Double the carbs, double the fun. But seriously, this salad really has got it all going on: crunchy veggies, crunchy-chewy toasted bagel bites, salty smoked salmon and soft mozzarella, all in balsamic-and-onion dressing. Really, it's not so different from a summery panzanella salad ... but with some pasta. 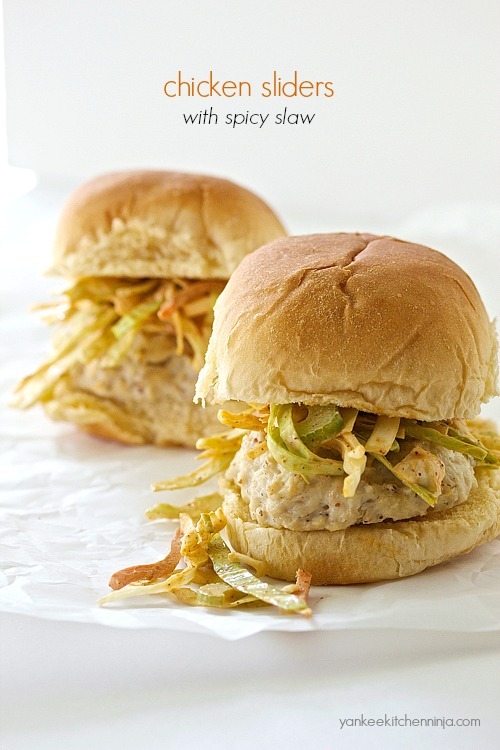 Bake these chicken sliders topped with crunchy, spicy slaw for an easy weeknight meal or grill them as a fun addition to a backyard BBQ. Even thought it's summertime, I still like to use my oven for weeknight meals. While the grill is great (largely because it gets Mr. Ninj involved in preparing the meal! ), sometimes it's easier for me to throw dinner in the oven and not have to monitor it as closely as when we grill outdoors. One thing I love about these cute chicken sliders with spicy slaw is that they are perfect for either cooking method, baking or grilling, based largely on the little bit of mayo that's part of the burger mixture to ensure they stay nice and moist while cooking. But whichever way you prefer to prepare them, please don't skip the spicy slaw on top. Slaw on burgers: is this new to you? Since I love creamy chopped coleslaw on a pulled pork sandwich, I figured adding slaw to a chicken slider isn't much different. Maybe a little messy (definitely a recipe I would add to my "Don't Eat on a First Date or Job Interview" list), but I love the extra crunch that the slaw adds. Plus, putting the slaw on rather than next to the chicken sliders means no additional condiments are necessary, keeping it a little bit lighter. And we're all about lighter around here. This no-cook raw vegetable salad is the perfect meal salad for hot summer nights or crowd-pleasing side at your next summer BBQ. You know The Ninj is all about healthy, real-food recipes that are easy to make, right? So what could be healthier and easier than a raw vegetable salad? Pretty much nothing, peeps. No cooking. Just chopping. Good eating. 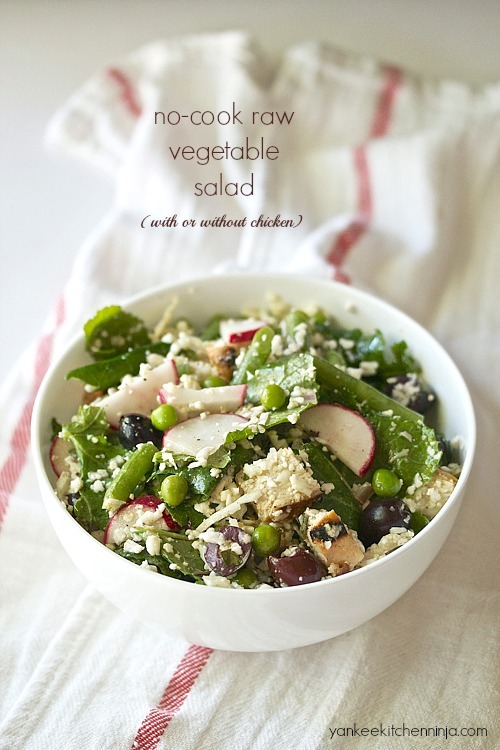 I've adapted this raw vegetable salad recipe from one by London chef Yotam Ottolenghi (he of the gorgeous Plenty cookbook fame), so you know it's bound to be super fresh and healthy, loaded with good-for-you veggies readily available at your local grocery or -- better yet -- farmers market. Plus, it's packed with grated cauliflower. Yes, grated, which it turns out in awesome way to overcome Mr. Ninj's texture aversion to cauliflower (and dupe him initially into thinking it was grated cheese!). Now, being The Meatasaurus, I chose to add some grilled chicken to this salad -- which probably makes the vegetarian Chef Ottolenghi cringe, but that's how I roll. It's completely optional if you prefer the meatless route or want to use this salad as a side rather than a main dish salad. Chicken or not, you're going to dig the light but tangy vinaigrette plus how super-fast it is to whip up this salad. Pasta salad nicoise: a modern take on the classic composed salad, portable and perfect for hot summer nights and busy weeknight meals. Even though National Salad Month is behind us, I just can't stop eating salads! I blame the hot weather we've been having. Jeez louise, it feels more like August than June out there on most days. Which doesn't really inspire me to fire up the oven. 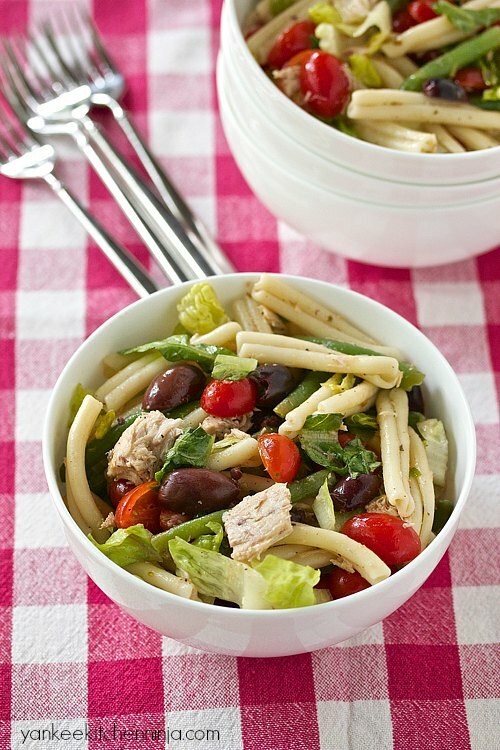 Not to mention that salads are a such a fast way to pull together a healthy and easy weeknight dinner, especially when you add some healthy protein like the tuna in this pasta salad nicoise, a riff on the classic composed salad. Are you a fan of salad nicoise? When I was a kid, every once in a while my mom would make a large, composed salad nicoise -- I loved how incredibly fancy it seemed, with all the ingredients in individual groupings instead of tossed together, which was my only notion of "salad" at the time. But even now, as then, I'm not a composed salad kind of gal, so I've tossed my salad nicoise all together to let the flavors really mingle in the lemony vinaigrette and added some pasta in place of the more traditional potato because ... well, because it's pasta and I love it heaps more than potatoes. One of my favorite time-saving tricks is blanching or flash-cooking veggies for pasta by adding them into the pasta pot for the last few moments of cook time. This works especially well for recipes that call for frozen veg like peas or edamame. Here, you can keep dinner prep moving quickly by adding the green beans to the pasta water and then draining and rinsing the pasta and the beans simultaneously. 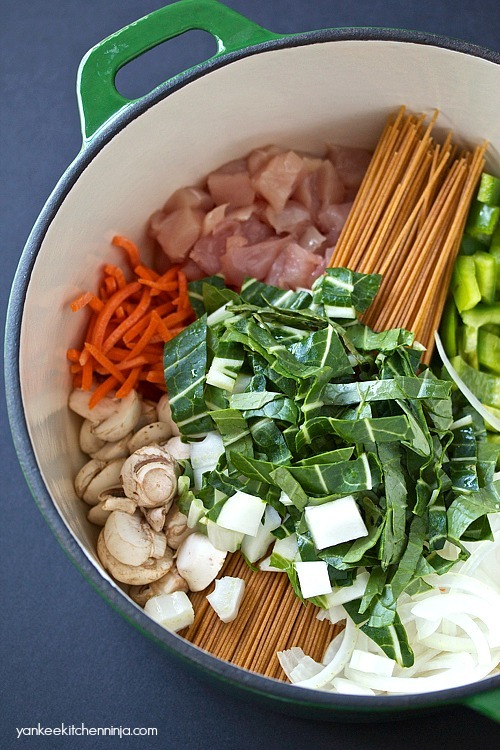 Get a complete, good-for-you dinner on the table in 10 minutes with this one pot Asian pasta. Weeknight dinnertime just got easier -- and healthier! That means I don't have to be a rocket scientist to understand that you love you some quick-and-easy weeknight meals. With pasta. Well, guess what? ME, TOO! Which is why I've come up with another one-pot pasta for you. As with the one pot tomato basil pasta, it's ridiculously easy and comes together in one pot in 10 minutes. Yes! Ten minutes to dinner, plus leftovers for lunch. And this one pot Asian pasta is healthy, too, loaded with good-for-you veg like peppers, carrots, mushrooms and bok choy. Plus, the pasta is whole wheat (feel free to opt for a gluten-free pasta if that's your jam). With or without chicken, it's a healthy, complete dinner that I know your entire family will love. And it's ready in 10 freakin' minutes, people!! No lie. If you haven't yet tried one of these one-pot wonder pastas, you're going to go cray cray over this. You simply throw all the ingredients into one large pot, bring it to a boil, stir like a maniac and then -- WHAM! -- dinner is complete. Healthy taco salad: loaded with veggies, lean beef and beans, it doesn't skimp on taste or crunch yet takes less than 10 minutes to prepare. National Salad Month may be behind us, but you'd never know it if you're eating dinner at Casa de Ninj. I think it's the change in the weather and the arrival of fresh produce (well, some) at the local farm markets. It makes me want to cram in as much fresh veg as I can. Yet, I am still The Meatasaurus, which means that many of my favorite salads include a healthy portion of protein as well as crisp, crunchy veg. 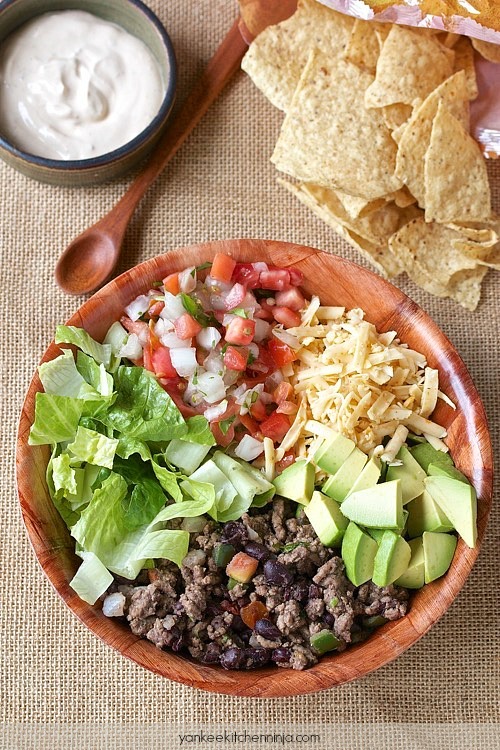 And this 10-minute taco salad is no exception. Plus, it gets its protein boost from a mixture of super-lean ground beef and black beans. And yes, it takes less than 10 minutes to assemble this whole taco salad. Ten minutes! Everyone has 10 minutes to prepare dinner! Are you psyched now? 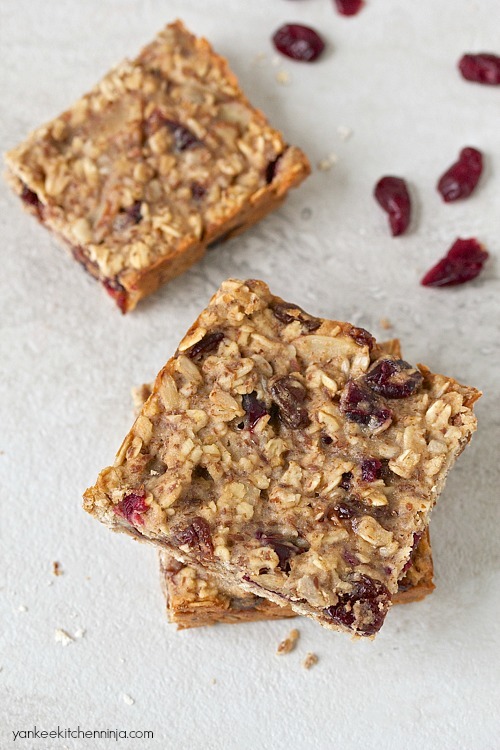 Fruit and grain energy bars are protein-rich, delicious and easy to prepare -- a perfect portable breakfast or afternoon snack. These easy, homemade fruit and grain energy bars have successfully gotten us out of our current breakfast rut at Casa de Ninj. They are just the right amount of chewy and not too sweet -- perfect for a grab-and-go breakfast. The danger is that they are so good that I'm tempted to keep making batch after batch. But eating them constantly would likely get us into another breakfast rut, right? Gaaaaah, when will I learn?! And if you're not in a breakfast rut, these are still the bars for you. Their portability (and freezability!) make them great afternoon snacks. 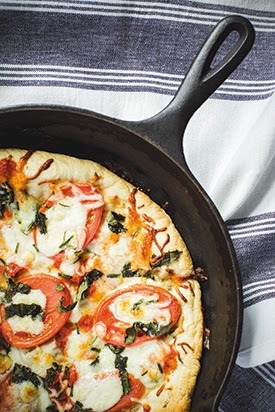 If Friday night is pizza night at your house, you're going to want to try this easy recipe for making perfect pizza crust in a cast-iron skillet. In case you didn't realize, being The Ninj doesn't exactly pay the bills around here. Sure, it's fun to get cheese in the mail, but we've got a mortgage, too. So I do quite a bit of freelance writing and consulting as well. One of my favorite gigs is writing for Edible Green Mountains magazine. For the current spring 2015 issue, I tackled cast iron. Well, cast-iron skillets anyway: what they are, why they're classic, how to use them and how to care for them. Plus, I shared a recipe for a cast-iron skillet pizza, given to me by my cousin and all-around amazing home cook Susan. If, like me, every Friday night is homemade pizza night in your house, you're going to want to give this recipe a try. It has become Mr. Ninj's favorite. So much so that he was visibly disappointed when I cheated and used a store-bought pizza shell because I'd already packed and moved my cast-iron skillet to our new home. 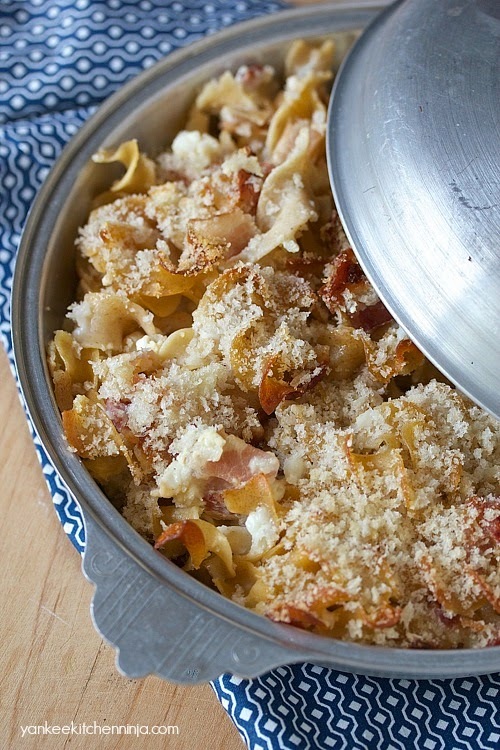 Ukrainian mac and cheese: a rich and cheesy comfort food pasta dish -- with bacon! 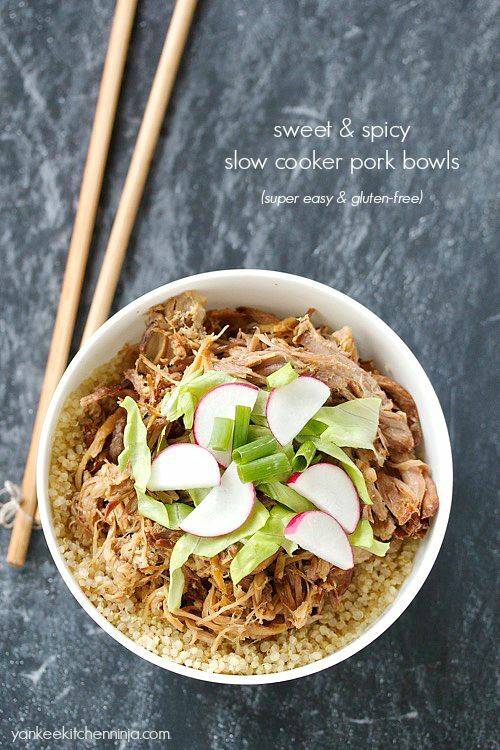 -- that's lightened, guilt-free and easy enough for a busy weeknight. I'm not even going to get into, yet again, how much of a pasta addict I am. But I'm starting to wonder if I'm actually more of a comfort food addict -- and most of my favorite comfort foods are pasta dishes? Either way, I've got an amazing double whammy for you today. Ukrainian mac and cheese, which is comfort food pasta that I'm completely cray cray about right now. And there's bacon in it. But never fear: This Ukranian mac and cheese is also a lightened recipe, so you don't have to feel guilty about digging into all the rich, cheesey goodness. And speaking of cheesiness, the only cheese in this mac and cheese is cottage cheese, giving it less of an ooey-gooey cheesiness and more of a rich and creamy cheesiness. Why Ukrainian? Well, the recipe I adapted it from calls for lokshyna, which are Ukrainian egg noodles. Given that I have no bloody idea where I'd find something like that, I simply used whole-wheat egg noodles but kept the Ukrainian nomenclature as a nod to its origins. Booyah: We're getting all international over here, aren't we? Celebrate National Salad Month all summer long with these seven recipes for healthy, hearty meal salads. Meal salads are a staple around Casa de Ninj, especially lately, as I've been needing to keep our weeknight meals quick and easy since our verrrrrrrrrrry slow cross-town move is taking up a lot of my time. Plus, the farmers' markets are re-opening, the CSA share sign-ups have begun and my summer veggie plants are starting to get big. Yay for fresh vegetables! So in honor of the impending summer fresh vegetable bounty and National Salad Month, here's a bookmarkable roundup of all my favorite meal salads. 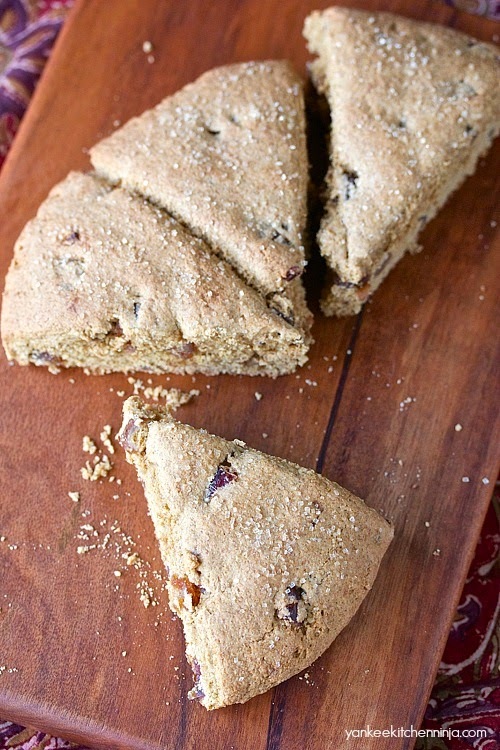 Maple date scones are an easy-to-make, healthier, less-sweet treat for breakfast, dessert or an afternoon snack. While I like sweet snacks and desserts as much as the next ninja, I generally prefer my baked goods to be a little less on the sweet side. Which is why I'll choose a scone over a cupcake any day. And any time I can sweeten a sweet more naturally than simply using refined sugar, I'm all over it. As their name implies, these maple date scones are sweetened with pure maple syrup, chewy dates and almost no added sugar. 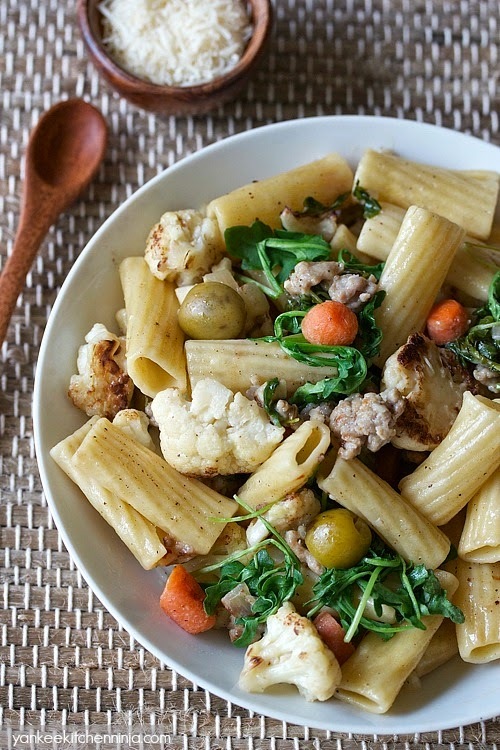 A better way to eat cauliflower: healthy and easy pan-roasted cauliflower pasta with spicy sausage, arugula and olives. I think I may have mentioned a few hundred times that I'm a pasta addict. In fact, I always say that if you really wanted to punish me, you wouldn't have to send me to prison -- just make me give up carbs. Yet I don't do your standard American spaghetti and meatballs. I like my pasta to be interesting. Like when it includes healthy, yummy ingredients like butternut squash, pumpkin, olives, beets, broccoli and even sardines. No bacon in this cauliflower pasta but there is spicy Italian sausage, another one of my pasta add-in faves. The spiciness pairs really well with the pan-roasted flavor of the cauliflower and the peppery arugula. Yep, you pan-roast the cauliflower in this stove-top meal. It comes out tender with just the right amount of cruciferous crunchiness left. And who couldn't benefit from a better way to eat lots of cauliflower than drowning it in cheese sauce or picking it off a crudite platter, am I right? 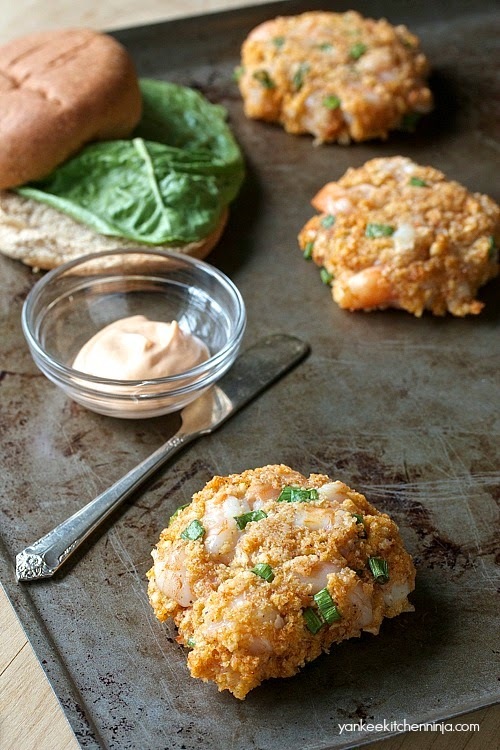 Healthy baked shrimp burgers are an easy way to get that summery, eating-at-the-beach feeling without leaving home. Are you familiar with shrimp burgers? If not, be prepared to become a fan. My obsession with shrimp burgers started during a family beach vacation on the North Carolina Outer Banks. Based on a local's recommendation, we got some shrimp burgers from the famous Big Oak Drive In in Salter Path, adjacent to Emerald Isle. Oh boy. Talk about summer on a bun. Being The Ninj, of course, I decided I needed to try to recreate these beauties at home. After years of trying lots of recipes and variations both by me and my mother-in-law, who is a much better cook than I am, we gave up. Somehow, neither of us could find the right mix that would give us the flavor we wanted yet still hold together well enough to be eaten as a burger in a bun. Now, mind you, the flavor of these shrimp burgers is a little different than those of Big Oak fame, but I don't care. Not so long as I can have a beloved shrimp burger that won't crumble into a mound of individual shrimp pieces after the first bite. Plus, mine are just a wee bit healthier. The funny thing is, the original recipe that inspired my shrimp burgers wasn't really intended to be a burger at all but a shrimp cake. Plus, it called for frying the cakes in quite a bit of oil. And you know I'll never fry when I can bake or roast to make a recipe healthier while also keeping my stovetop clean.